Queue jumpers are the WORST. Be it at your local foodie hotspot, at the checkout counter, or god forbid – the drivers on the highways who seem oblivious to the fact that using the emergency lane for no good reason is WRONG! A fellow netizen felt that these drivers need to be taught a lesson. “Hello. 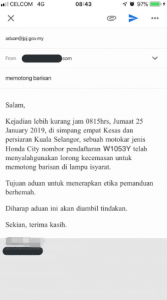 The incident took place at 0815hrs, Friday 25th of January 2019, at the Kesas and Persiaran Kuala Selangor junction, a Honda City with registration number W****Y has misused the emergency lane to jump the queue at the traffic light. The purpose of this complaint is to educate the driver on the importance of driving etiquette. 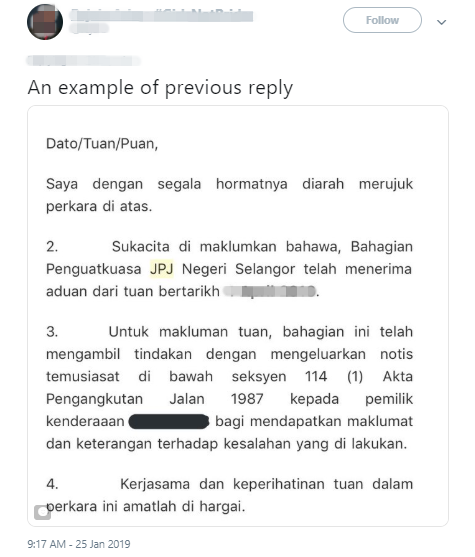 He also showed how a reply by JPJ would look. One netizen commended this tactic to keep wrongdoers at bay. Another netizen sought clarification on the types of offences that could be reported to the authorities. 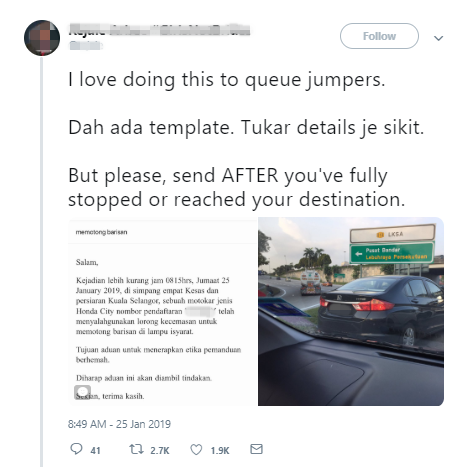 The netizen responded that any form of offence can be reported directly to JPJ. The power is in your hands. Just don’t let it get to your head.